This is one of the few privately owned bridges in America. It was closed briefly for safety concerns in the early 1990s, but reopened. A toll of 50 cents is collected in each direction, on the Maryland side of the river. The bridge is decked in wood and does not have railings. 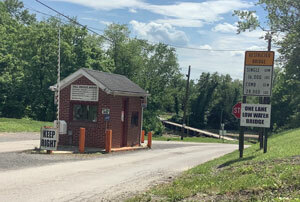 It connects Green Spring Road in Allegany County with West Virginia Mineral County Route 1.